The tingletini is made with passion fruit vodka, simple syrup, lime juice, and jalapeno peppers. Guess you know the tingle comes from that last ingredient, huh? The presentation for this cocktail is beautiful. 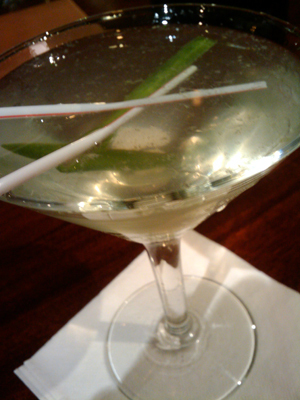 I especially like how the crossed straws mimic the crossed jalapeno slivers. It’s almost clear, but the lime juice provides a misty, super-light-green tint. This drink proves to me for a second time that passion fruit vodka is a great choice for cocktails, because it has a way of dulling that vodka heat with a unique, light fruit flavor. Some might call that watering down a drink, but I think it makes one like this very enjoyable. Mild jalapeno spice crossed my tongue first, quickly followed by the mellowing vodka. The simple syrup was moderately used, thankfully, and the lime juice almost didn’t contribute at all, but I think it was best as a very subtle element in the mixture. At the end of the sip, the jalapeno comes back at me, reminding me that I ordered this drink because I like spice in my life.